WOKINGHAM, England – Christie®, a leader in creating and delivering the world’s best visual and audio experiences, is pleased to announce that its latest Christie HS Series projectors will be used at the GLOW Eindhoven international light art festival from November 10 to 17 at Eindhoven city center. A total of 12 Christie D20WU-HS projectors will be utilized in an impressive video mapping installation on the face of the 19th century Catharinakerk, a neo-gothic Roman Catholic church located in the center of Eindhoven. The projectors – which are being provided by Christie partner Sahara Benelux – are the lightest and brightest 1DLP® laser phosphor projectors available. 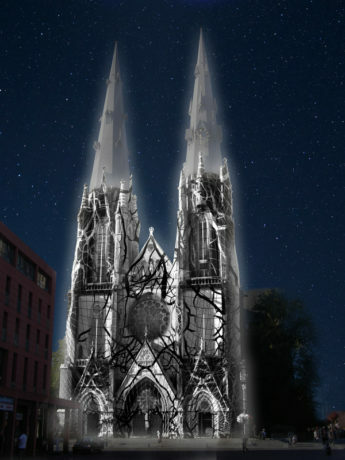 At Catharinakerk, visitors will see the Confluence video mapping installation powered by the D20WU-HS projectors, which can operate at full brightness on a single 15A, 110V circuit. The original project – created by Ocubo – is inspired by the confluence of rivers and streams in Holland. The kinetic art will also see virtual dancers guide the viewer through the film, with flourishes of color emphasizing the church’s stunning architecture in an array of eye-catching geometric combinations. Christie partner, Sahara Benelux, is also providing 10 Christie UHD 551-L LCD panels for Glowie, an interactive art installation combining chatbot technology, voice commands and light art.